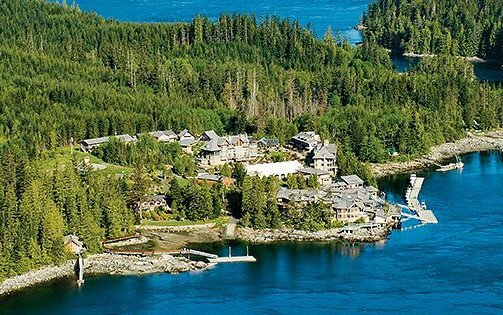 Located in the northern wilderness of British Columbia where the Campbell River meets the sea is a magical resort that’s a wildlife fantasy. Sonora Resort is the ultimate coastal escape, combining ec0-adventure with luxury travel in a pristine wilderness environment. To make it all the more intriguing, this breathtaking destination is accessible only by seaplane, helicopter or water taxi. Immerse yourself in the tranquil nature at Sonora Resort with so many magical places to explore. It’s truly a dream destination with its beautiful grounds in lush forests near the sea shore. This adventure is all about discovery and appreciation of the surrounding wilderness. Test your angler skills against coho, chum, sockeye and pink salmon. Take a trip on the turquoise waters of Bute Inlet or off the rough shores of the Discovery Islands. A helicopter tour brings a whole new angle on the crystal-clear waters and the nearby majestic mountain glacier. Discover the secret life of bears on the Grizzly Tour. A unique 10-foot viewing stand is your platform for watching a 300-pound Grizzly catch salmon in the crashing river. You can glide through glass-like waters in a kayak spotting wildlife including mink, otters, seals, whales, and playful dolphins. Look up to catch a glimpse of bald eagles, kingfishers in their vibrant colors, and heron. Take in all of the outdoor adventure opportunities knowing that luxury awaits you back at the resort where you can indulge with relaxing spa treatments. Soak up the view of the deep blue Pacific Ocean from your perch in a hot pool filled with naturally healing minerals. Dine on gourmet cuisine with the freshest ingredients. Back in your lodge the outdoor beauty continues to surround you. Each room offers breathtaking views of the alpine wilderness, white rapids, towering mountains, or the ocean peeking out just beyond the forest. Relax in a rooftop hot tub. Walk on warm heated floors and sleep peacefully on luxurious 300-thread count satin linens snuggled atop goose down duvets. Every lodge is beautifully appointed with natural elements that mesh seamlessly with nature and all feature stunning native artwork. The cozy surroundings are complimented by impeccable 5-star service. Rates for Sonora Resort start at about $380/night. For more information visit Sonora Resort.